A patient operated upon for removal of abdominal tumor by a qualified doctor by adopting best procedure - Pancreas of patient slightly damaged - Death of patient after about six months - No medical negligence. Medical negligence - An error in judgment is not necessarily negligence. It is a landmark judgment regarding Medical negligence based on leading cases of medical negligence both in India and other countries especially U.K.
Before :- Dalveer Bhandari and Harjit Singh Bedi, JJ. For the Appellant :- Gp. Capt., Karan Singh Bhati, Ms. Aishwarya Bhati, Himanshu Singh and Ms. Rekha Giri, Advocates. For the Respondent :- Manvendra Verma, Sudhir Vats, Sanveer Mehalwal (for Ms. Kamakshi S. Mehlwal), Parmanand Gaur (N.P. ), Sudhir Kumar Gupta (N.P. ), Somnath Mukherjee, (N.P.) and Ankit Gupta (for Maninder Singh), Advocates. A. Consumer Protection Act, 1986, Sections 21 and 2(1)(a) - Medical negligence - Deficiency in Service - A patient operated upon for removal of abdominal tumor by qualified doctor by adopting best procedure - Pancreas of patient slightly damaged - Death of patient after about six months - No medical negligence. Patient had tumor in abdomen - Surgical operation was carried out for removal of abdominal tumor and tumor was removed - During surgery body of pancreas was damaged which was treated - Second surgery was carried out by an other expert doctor - After that the patient obtained treatment from AIMS - Death of the patient after about 6 months - Death attributed due to medical negligence and petition filed before National Commission claiming compensation of Rs 45 lakhs - Eminent doctors of AIMS examined and medical literature brought into evidence - National Consumer Commission found that there was no medical negligence - It came in evidence that hospital and doctors attended the deceased with utmost care, caution and skills and with devotion and dedication - The doctor who performed the operation had reasonable decree of skill and knowledge and adopted the procedure, which in their opinion was in the best interest of the patient - Finding of National Consumer Commission their doctor was not guilty of negligence - Finding upheld. To impose criminal liability under Section 304A, Indian Penal Code, it is necessary that the death should have been the direct result of a rash and negligent act of the accused, and that act must be the proximate and efficient cause without the intervention of another's negligence - It must be the causa causans; it is not enough that it may have been the causa sine qua non. (1980) 1 SCC 30, AIR 1968 SC 1319, (1965) 2 SCR 622 relied. 1. When the charge of negligence arises out of failure to use some particular equipment, the charge would fail if the equipment was not generally available at that point of time. 2. A mere deviation from normal professional practice is not necessarily evidence of negligence. 3. Higher the acuteness in emergency and higher the complication, more are the chances of error of judgment. 4. Doctors in complicated cases have to take chance even if the rate of survival is low. 5. Courts have to be extremely careful to ensure that professionals are not harassed unnecessarily - A surgeon with shaky hands under fear of legal action cannot perform a successful operation and a quivering physician cannot administer the end-dose of medicine to his patient. 6. A professional deserves total protection - The Indian Penal Code has taken care to ensure that people who act in good faith should not be punished - Sections 88, 92 and 370 of the Indian Penal Code give adequate protection to the professional and particularly medical professionals.2005(3) RCR(Crl) 836 relied. 1. Negligence cannot be attributed to a doctor so long as he is performing his duties to the best of his ability and with due care and caution - Merely because the doctor chooses one course of action in preference to the other one available, he would not be liable if the course of action chosen by him was acceptable to the medical profession. 3. To prosecute a medical professional for negligence under criminal law it must be shown that the accused did something or failed to do something which in the given facts and circumstances no medical professional in his ordinary senses and prudence would have done or failed to do.2005(3) RCR (Crl) 836, (1995) 6 SCC 651, (1996) 2 SCC 634 relied. 1. Negligence is the breach of a duty exercised by omission to do something which a reasonable man, guided by those considerations which ordinarily regulate the conduct of human affairs, would do, or doing something which a prudent and reasonable man would not do. 2. Negligence is an essential ingredient of the offence. The negligence to be established by the prosecution must be culpable or gross and not the negligence merely based upon an error of judgment. 3. The medical professional is expected to bring a reasonable degree of skill and knowledge and must exercise a reasonable degree of care. Neither the very highest nor a very low degree of care and competence judged in the light of the particular circumstances of each case is what the law requires. 4. A medical practitioner would be liable only where his conduct fell below that of the standards of a reasonably competent practitioner in his field. 5. In the realm of diagnosis and treatment there is scope for genuine difference of opinion and one professional doctor is clearly not negligent merely because his conclusion differs from that of other professional doctor. 6. The medical professional is often called upon to adopt a procedure which involves higher element of risk, but which he honestly believes as providing greater chances of success for the patient rather than a procedure involving lesser risk but higher chances of failure. Just because a professional looking to the gravity of illness has taken higher element of risk to redeem the patient out of his/her suffering which did not yield the desired result may not amount to negligence. 7. Negligence cannot be attributed to a doctor so long as he performs his duties with reasonable skill and competence. Merely because the doctor chooses one course of action in preference to the other one available, he would not be liable if the course of action chosen by him was acceptable to the medical profession. 8. It would not be conducive to the efficiency of the medical profession if no Doctor could administer medicine without a halter round his neck. 9. It is our bounded duty and obligation of the civil society to ensure that the medical professionals are not unnecessary harassed or humiliated so that they can perform their professional duties without fear and apprehension. 10. The medical practitioners at times also have to be saved from such a class of complainants who use criminal process as a tool for pressurizing the medical professionals/hospitals particularly private hospitals or clinics for extracting uncalled for compensation. Such malicious proceedings deserve to be discarded against the medical practitioners. 11. The medical professionals are entitled to get protection so long as they perform their duties with reasonable skill and competence and in the interest of the patients. The interest and welfare of the patients have to be paramount for the medical professionals.2005(3) RCR(Crl) 836 relied. 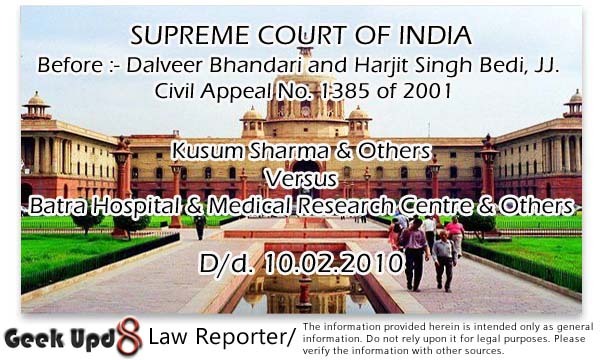 Spring Meadows Hospital v. Harjot Ahluwalia through K.S. Ahluwalia, (1998) 4 SCC 39. Dr. Laxman Balkrishna Joshi v. Dr. Trimbak Bapu Godbole, AIR 1969 SC 128. Bolam v. Friern Hospital Management Committee, (1957) I WLR 582 : (1957) 2 All ER 118. Roe and Woolley v. Minister of Health, (1954) 2 QB 66. Whitehouse v. Jordon, (1981) 1 All ER 267. Chin Keow v. Government of Malaysia, (1967) WLR 813. State of Haryana v. Smt. Santra, 2000(2) R.C.R. (Civil) 739 : (2000) 5 SCC 182. Poonam Verma v. Ashwin Patel, (1996) 4 SCC 332. R. v. Lawrence, 1981(1) All ER 974. R. v. Caldwell, 1981(1) All ER 961. Andrews v. Director of Public Prosecutions, (1937) A.C. 576. Syad Akbar v. State of Karnataka, (1980) 1 SCC 30. Bhalchandra alias Bapu v. State of Maharashtra, AIR 1968 (SC) 1319. Jacob Mathew v. State of Punjab, 2005(3) R.C.R. (Criminal) 836 : 2005(2) Apex Criminal 649 : (2005) 6 SCC 1. Michael Hyde and Associates v. J.D. Williams & Co. Ltd., (2001) P.N.L.R. 233. Hucks v. Cole, (1968) 118 New LJ 469. Hunter v. Hanley, 1955 SLT 213. John Oni Akerele v. King, AIR 1943 PC 72. Kurban Hussein Mohammedali Rangawalla v. State of Maharashtra, (1965) 2 SCR 622. Emperor v. Omkar Rampratap, (1902) 4 Bom LR 679. Indian Medical Association v. V.P. Shantha, (1995) 6 SCC 651. Achutrao Haribhau Khodwa v. State of Maharashtra, (1996) 2 SCC 634. C.P. Sreekumar (Dr.), MS (Ortho) v. S. Ramanujam, (2009) 7 SCC 130. Dalveer Bhandari, J. - This appeal is directed against the judgment and order dated 30th August, 2000 passed by the National Consumer Disputes Redressal Commission, New Delhi (for short, 'National Commission') in Original Petition No.116 of 1991. 2. The appellants filed a complaint under section 21 of the Consumer Protection Act, 1986 claiming compensation of Rs. 45 lakhs attributing deficiency in services and medical negligence in the treatment of the deceased Shri R.K. Sharma (who was the husband of appellant No. 1, Kusum Sharma and the father of appellant Nos. 2 and 3). 4. Late Shri R.K. Sharma was a Senior Operations Manager in the Indian Oil Corporation (Marketing Division). In June 1989, he developed blood pressure. He was very obese. He complained of swelling and breathlessness while climbing stairs. He visited Mool Chand Hospital on 10.12.1989 but no diagnosis could be made. The Indian Oil Corporation referred him to Batra Hospital on 14.3.1990 where he was examined by Dr. R.K. Mani, respondent No. 2 and Dr. S. Arora who advised him to get admitted for Anarsarca (Swelling). 5. On 18.3.1990, Shri Sharma was admitted in Batra Hospital. On 20.3.1990, an ultrasound of abdomen was done and the next day, i.e., on 21.3.1990, a C.T. scan of abdomen was done and it was found that there was a smooth surface mass in the left adrenal measuring 4.5 x 5 cm and that the right adrenal was normal. Surgery became imperative for removing the left adrenal. The deceased, Shri Sharma and appellant No. 1 were informed by Dr. Mani, respondent No. 2 that it was well encapsulated benign tumor of the left adrenal of less than 5 cm in size which could be taken out by an operation. It was decided to carry out the surgical operation for the removal of abdominal tumor. On 2.4.1990, the doctor obtained consent from the appellants for the operation of removal of abdominal tumor. On test, the tumor was found to be malignant. The treatment for malignancy by way of administering Mitotane could not be given as it was known to have side effects. 6. The surgery was carried out on 2.4.1990 by Dr. Kapil Kumar, respondent No. 3. During the surgery, the body of the pancreas was damaged which was treated and a drain was fixed to drain out the fluids. According to the appellants, considerable pain, inconvenience and anxiety were caused to the deceased and the appellants as the flow of fluids did not stop. After another expert consultation with Dr. T.K. Bose, respondent No. 4 a second surgery was carried out on 23.5.1990 in Batra Hospital by Dr. Bose assisted by Dr. Kapil Kumar. 7. Shri Sharma was fitted with two bags to drain out the fluids and in due course, wounds were supposed to heal inside and the fluid was to stop. The deceased was discharged on 23.6.1990 carrying two bags on his body, with an advice to follow up and for change of the dressing. The deceased next visited Batra Hospital only on 31.8.1990 and that too to obtain a Medical Certificate from Dr. Mani, respondent No. 2. 8. On 9.10.1990, Shri Sharma vomited at home and arrangements for shifting him to the Batra Hospital were made and the Hospital's ambulance sent by Dr. Mani. Shri Sharma died in the hospital on 11.10.1990 on account of 'pyogenic meningitis'. 10. The deceased, on the suggestion of Dr. Bose, respondent No. 4 visited Modi Hospital on 10.7.1990 where Dr. Bose was a Consulting Surgeon for change of dressing after 17 days. Respondent Nos. 2 and 3, namely, Dr. Mani and Dr. Kapil Kumar visited the residence of the deceased on 14.7.1990 and found him in a bad condition and asked him to go to AIIMS where he was admitted on 22.7.1990 and treatment was given for pancreatic fistula and chronic fistula. He was discharged on 26.7.1990 with an advice to follow up in the O.P.D. The deceased again went to Mool Chand Hospital on 17.8.1990 with pancreatic and feacal fistula which was dressed. The deceased was discharged from Mool Chand Hospital on 31.8.1990. The deceased went to Jodhpur on 29.9.1990 and on 30.9.1990 he had to be admitted in the Mahatma Gandhi Hospital at Jodhpur where he was diagnosed with having post-operative complications of Adrenoloctomy and Glutteal abscess. The deceased was discharged from there on 3.10.1990 with an advice to get further treatment at AIIMS and when the deceased again went to AIIMS on 8.10.1990, Dr. Kuchupillai, a senior doctor at AIIMS wrote on a slip 'to be discussed in the Endo-Surgical Conference on 8.10.1990'. 16. According to the appellants, the 'anterior' approach adopted at the time of first surgery was not the correct approach. Surgery should have been done by adopting 'posterior' approach for removal of left adrenal tumor. Dr. Kapil Kumar, respondent No. 3 after the first operation on 2.4.1990 told the appellants that the operation was successful and the tumor was completely removed which was in one piece, well defined and no spreading was there. After the surgery, blood was coming out in a tube which was inserted on the left side of the abdomen. On specific query made by the deceased and appellant No. 1, respondent Nos. 2 and 3 told them that the pancreas was perfectly normal but during operation on 2.4.1990, it was slightly damaged but repaired instantly, hence there was no cause of any anxiety. When the fact of damage to pancreas came to the notice of the deceased, he asked for the details which were not given. The appellants alleged that the tumor taken out from the body was not malignant. Resection of the left adrenal gland requires mobilization of the spleen and left colon. The lateral peritoneal attachments of the left colon are freed, initially. Then the spleen is scooped out from the left upper guardant medially and the avascular attachments between the spleen and diaphragm are divided. The spleen, stomach, pancreatic tail and left colon are retracted medially en bloc to the superior mesenteric vessels. The left adrenal gland is exposed splendidly in this manner". - Peritoneum, Retroperitoneum and Mesentery - Section IV. 20. The medical texts quoted above speak of both the approaches for adrenaloctomy. Nowhere the appellant No. 1 has been able to support her contention that posterior approach was the only possible and proper approach and respondent No. 3 was negligent in adopting the anterior approach. 21. Apart from the medical literature, Dr. N. K. Shukla, Additional Professor at AIIMS and a well-know surgeon stated in unequivocal terms in response to a specific question from the appellant No. 1 that for malignant tumors, by and large, we prefer anterior approach. 22. Dr. Nandi, Professor and Head of Department of Gastro-Intestinal Surgery at AIIMS also supported 'anterior' approach and confirmed and reconfirmed adoption of 'anterior' approach in view of inherent advantages of the approach. 27. Another complaint made by the appellants was with regard to 'Gluteal abscess' which was attributed to 'pyogenic meningitis' resulting in the death of Shri Sharma which was first observed in the Medical College Hospital at Jodhpur, where the deceased had gone in connection with performing certain rites in connection with the death of his mother-in-law. The Gluteal abscess was drained by a simple incision. He was discharged from there on 3.10.1990 with an advice to go to AIIMS, New Delhi and meet Dr. Kuchupillai, the Endoconologist. According to the doctor, there was not even a whisper of any incision or draining of gluteal abscess. The Essentiality Certificate makes it clear that no incision was made to drain out gluteal abscess. 29. This court issued notice and in pursuance to the notice issued by this court, a counter affidavit on behalf of respondent No. 1 has been filed by Dr. Ranbir Kumar Gupta. It is mentioned in the affidavit that although the respondents fully sympathized with the appellants' unfortunate loss, the respondents are constrained to submit that the appellants had presented a malicious, fabricated and distorted account to create a false impression that the respondents were guilty of negligence in treating late Shri R.K. Sharma. 30. The respondents also submitted that the appellants have ignored the fact that the medicine is not an exact science involving precision and every surgical operation involves uncalculated risks and merely because a complication had ensued, it does not mean that the hospital or the doctor was guilty of negligence. A medical practitioner is not expected to achieve success in every case that he treats. The duty of the Doctor like that of other professional men is to exercise reasonable skill and care. The test is the standard of the ordinary skilled man. It is further submitted in the counter affidavit that the hospital and the doctors attended late Shri Sharma with utmost care, caution and skill and he was treated with total devotion and dedication. Shri Sharma's death was attributable to the serious disease with which he was suffering from. It is also mentioned that the conduct of the deceased himself was negligent when he was discharged on 23.6.1990. The doctors specifically advised him "Regular Medical Follow Up" which the deceased failed to attend. In fact, subsequently, it was respondent No. 4 who called upon the deceased and persuaded him to visit the Modi Hospital for a change of dressing. The Fitness Certificate issued to the deceased also bore the endorsement "he would need prolonged and regular follow up". However, the deceased did not make any effort and was totally negligent. The Dermatologist Dr. Kandhari reported that Shri R.K. Sharma had a fungal infection. After the reports of all the tests and the report of the hormonal assays had been received, respondent No. 2 came to a confirmed diagnosis that Shri R.K. Sharma had a secreting adrenal tumour. The patient was informed that surgery for removal of an adrenal tumour was planned. Appellant No. 1 was also informed that the tumour was suspected to be malignant. Mrs. Kusum Sharma told respondent No. 2 that one of her relations was a doctor working in Jodhpur Medical College and that she would like to consult him. The said relation of Smt. Kusum Sharma came down to Delhi, examined Shri R.K. Sharma and went through all the reports. Thereafter, Smt. Kusum Sharma gave consent for the surgery. Dr. Kapil Kumar, who specializes in surgical oncology, i.e., cancer surgery was asked to operate upon Shri R.K. Sharma. The risk involved in the operation was explained to the petitioner, her husband (now deceased) and their relative and they agreed after due consultation with their family doctor." 32. Shri Sharma was operated on 2.4.1990 by Dr. Kapil Kumar, respondent No. 3 and the adrenal tumour was removed. During surgery it became necessary to remove the spleen of Shri R.K. Sharma. The operation was successful. However, the tail of the pancreas was traumatized during retraction as Shri R.K. Sharma was extremely obese. On examination, the injury to the pancreas was found to be superficial and non-ductal. The damage to the pancreas was repaired immediately with interrupted non-absorbable sutures and drains were placed. The injury to the pancreas was known during surgery and the same was repaired immediately. It was clearly recorded in the operation transcript that the body of the pancreas was damaged on its posterior surface. The said fact was recorded in the discharge summary. 33. It is submitted that after the surgery Shri R.K. Sharma was subjected to ultrasound imaging and sonogram. On 26.4.1990 respondent No. 2 ordered a CT Scan as he suspected the existence of a pancreatic abscess. The CT Scan report was suggestive of paripancreatic inflammation and pancreatic abscess. Thus the CT Scan merely confirmed the suspicion of appellant No. 1, the wife of Shri R.K. Sharma who was well aware of the injury to the pancreas and the possibility of there being a pancreatic abscess and she had long discussion with respondent Nos. 2 and 3 regarding the prognosis. It is denied that the patient and the appellants were assured that fluid discharge would stop within 2 or 3 days time or that it was normal complication after any surgery. 35. It is admitted that due to the insistence of the patient and the appellants to seek expert advice of the All India Institute of Medical Science the patient was referred to Sir Ganga Ram Hospital for E.R.C.P. Test. After the CT Scan report dated 26.4.1990 confirmed the existence of pancreatic abscess, on 28.4.1990, respondent Nos. 2 and 3 sought the advice of Dr. T.K. Bose, respondent No. 4. An E.R.C.P. test and Sonogram were recommended by respondent No. 4 and it was again respondent No. 4 who suggested that the opinion of Prof. Nandi of All India Institute of Medical Sciences be sought. E.R.C.P. and Sonogram are sophisticated tests and the patient can hardly be expected to be aware of such procedures. It is submitted that the E.R.C.P. test confirmed the initial diagnosis made by respondent Nos. 2 and 3 that there being a leakage from the pancreatic duct and showed the exact site of leakage. Determination of exact site of leakage is one of the principal functions of the E.R.C.P. test. 39. It is submitted that after his discharge from Batra Hospital on 23.6.1990, Shri R.K. Sharma did not maintain any contact with the answering respondents till 9.10.1990 barring one visit to respondent No. 2 on 31.8.1990 for the purpose of obtaining fitness certificate. The answering respondent cannot be held responsible for any mishap, which might have taken place when the deceased Shri R.K. Sharma was being treated elsewhere. 40. It is further submitted that no request was received by respondent No. 1 from AIIMS for supply of the case sheets or the tumour mass. Had such a request been received the case sheets would have been sent to AIIMS forthwith. The tumour mass would also have been sent subject to availability, as generally the mass is not preserved beyond a period of 4 weeks. As a standard practice, case sheets are never given to patients as they contain sensitive information which can affect their psyche. 45. In the discharge summary prepared initially it was recorded specifically that the adrenal mass was malignant and that the patient should be started on Mitotane at the earliest after the period of recovery from the operation. However, the appellants had requested respondent No. 2 to delete all references about cancer from the discharge slip as her husband was likely to read the same. She apprehended that in such an event her husband would become mentally disturbed. Having regard to the apprehension expressed by the appellant No. 1, Smt. Kusum Sharma, respondent No. 2 prepared a fresh discharge summary which did not contain any reference to cancer. The diagnosis of cancer was not an afterthought. The diagnosis of cancer was a considered one after two histopathological reports were received. It is however denied that the patient was told that he was suffering from cancer. 47. The learned counsel appearing for the appellants placed reliance on Spring Meadows Hospital & Another v. Harjot Ahluwalia through K.S. Ahluwalia & Another (1998) 4 SCC 39 and Dr. Laxman Balkrishna Joshi v. Dr. Trimbak Bapu Godbole, AIR 1969 SC 128. According to respondent No. 1, these cases have no application to the present case. The facts in these cases are entirely different and the law of negligence has to be applied according to the facts of the case. The direction that, where there are two different schools of medical practice, both having recognition among practitioners, it is not negligent for a practitioner to follow one in preference to the other accords also with American law; See 70 Corpus Juris Secundum (1951) 952, 953, para 44. Moreover, it seems that by American law a failure to warn the patient of dangers of treatment is not, of itself, negligence ibid. 971, para 48). 51. In Roe and Woolley v. Minister of Health (1954) 2 QB 66, Lord Justice Denning said : 'It is so easy to be wise after the event and to condemn as negligence that which was only a misadventure. We ought to be on our guard against it, especially in cases against hospitals and doctors. Medical science has conferred great benefits on mankind but these benefits are attended by unavoidable risks. Every surgical operation is attended by risks. We cannot take the benefits without taking the risks. Every advance in technique is also attended by risks. Doctors, like the rest of us, have to learn by experience; and experience often teaches in a hard way." "The test whether a surgeon has been negligent is whether he has failed to measure up in any respect, whether in clinical judgment or otherwise, to the standard of the ordinary skilled surgeon exercising and professing to have the special skill of a surgeon (dictum of McNair Jo. In Bolam v. Friern Hospital Management Committee (1957) 2 All ER 118 at 121). 55. This court in the case of State of Haryana v. Smt. Santra 2000(2) R.C.R. (Civil) 739 : (2000) 5 SCC 182 in the matter of negligence relied upon the case of Bolam v. Friern Hospital Management Committee (supra) and on Whitehouse v. Jordan & Another (supra). 57. In the instant case, Dr. Kapil Kumar, respondent No. 3 who performed the operation had reasonable degree of skill and knowledge. According to the findings of the National Commission, he cannot be held guilty of negligence by any stretch of imagination. 63. Judgment in the case of State of Haryana (supra) in the context of 'Negligence per se', is not applicable in the instant case, as herein, there was no violation of public duty enjoined by law. The term 'negligence' is used for the purpose of fastening the defendant with liability under the Civil Law and, at times, under the Criminal Law. It is contended on behalf of the respondents that in both the jurisdictions, negligence is negligence, and jurisprudentially no distinction can be drawn between negligence under civil law and negligence under criminal law. "18. In the law of negligence, professionals such as lawyers, doctors, architects and others are included in the category of persons professing some special skill or skilled persons generally. Any task which is required to be performed with a special skill would generally be admitted or undertaken to be performed only if the person possesses the requisite skill for performing that task. Any reasonable man entering into a profession which requires a particular level of learning to be called a professional of that branch, impliedly assures the person dealing with him that the skill which he professes to possess shall be exercised and exercised with reasonable degree of care and caution. He does not assure his client of the result. A lawyer does not tell his client that the client shall win the case in all circumstances. A physician would not assure the patient of full recovery in every case. A surgeon cannot and does not guarantee that the result of surgery would invariably be beneficial, much less to the extent of 100% for the person operated on. The only assurance which such a professional can give or can be understood to have given by implication is that he is possessed of the requisite skill in that branch of profession which he is practising and while undertaking the performance of the task entrusted to him he would be exercising his skill with reasonable competence. This is all what the person approaching the professional can expect. Judged by this standard, a professional may be held liable for negligence on one of two findings: either he was not possessed of the requisite skill which he professed to have possessed, or, he did not exercise, with reasonable competence in the given case, the skill which he did possess. The standard to be applied for judging, whether the person charged has been negligent or not, would be that of an ordinary competent person exercising ordinary skill in that profession. It is not necessary for every professional to possess the highest level of expertise in that branch which he practices. In Michael Hyde and Associates v. J.D. Williams & Co. Ltd. ,  P.N.L.R. 233, CA, Sedley L.J. said that where a profession embraces a range of views as to what is an acceptable standard of conduct, the competence of the defendant is to be judged by the lowest standard that would be regarded as acceptable. (Charles worth & Percy, ibid, Para 8.03)"
"19. Where you get a situation which involves the use of some special skill or competence, then the test as to whether there has been negligence or not is not the test of the man on the top of a Clapham omnibus, because he has not got this special skill. The test is the standard of the ordinary skilled man exercising and professing to have that special skill . . . A man need not possess the highest expert skill; it is well established law that it is sufficient if he exercises the ordinary skill of an ordinary competent man exercising that particular art." 81. It is a matter of common knowledge that after happening of some unfortunate event, there is a marked tendency to look for a human factor to blame for an untoward event, a tendency which is closely linked with the desire to punish. Things have gone wrong and, therefore, somebody must be found to answer for it. A professional deserves total protection. The Indian Penal Code has taken care to ensure that people who act in good faith should not be punished. Sections 88, 92 and 370 of the Indian Penal Code give adequate protection to the professional and particularly medical professionals. 86. In a significant judgment in Indian Medical Association v. V.P. Shantha (1995) 6 SCC 651, a three-Judge Bench of this Court held that service rendered to a patient by a medical practitioner (except where the doctor renders service free of charge to every patient or under a contract of personal service), by way of consultation, diagnosis and treatment, both medicinal and surgical, would fall within the ambit of 'service' as defined in Section 2(1)(o) of the Consumer Protection Act, 1986. Deficiency in service has to be judged by applying the test of reasonable skill and care which is applicable in action for damages for negligence. 88. In Achutrao Haribhau Khodwa & Others v. State of Maharashtra (1996) 2 SCC 634, this Court noticed that in the very nature of medical profession, skills differs from doctor to doctor and more than one alternative course of treatment are available, all admissible. Negligence cannot be attributed to a doctor so long as he is performing his duties to the best of his ability and with due care and caution. Merely because the doctor chooses one course of action in preference to the other one available, he would not be liable if the course of action chosen by him was acceptable to the medical profession. (1) Negligence is the breach of a duty caused by omission to do something which a reasonable man guided by those considerations which ordinarily regulate the conduct of human affairs would do, or doing something which a prudent and reasonable man would not do. The definition of negligence as given in Law of Torts, Ratanlal & Dhirajlal (edited by Justice G.P. Singh), referred to hereinabove, holds good. Negligence becomes actionable on account of injury resulting from the act or omission amounting to negligence attributable to the person sued. The essential components of negligence are three: 'duty', 'breach' and 'resulting damage'.